As my group and private students prepare for the recital, we try to practice performing as much as possible. 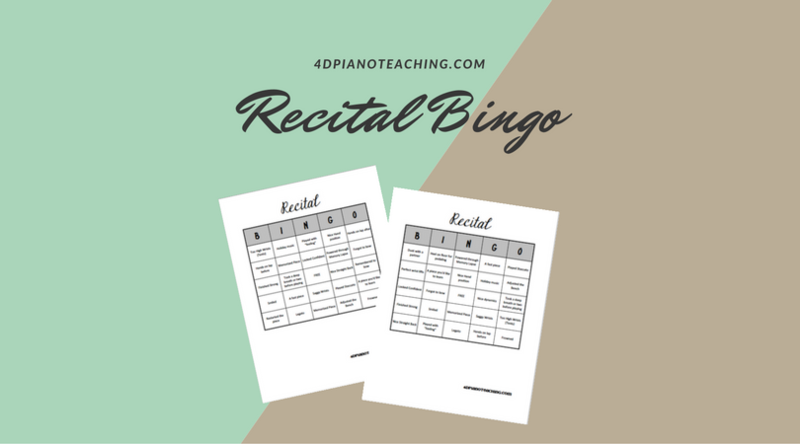 To encourage good audience listening, I’m using a recital bingo game that I’m sharing today. I’ve seen several versions on Facebook so I don’t know who exactly to credit with the idea but it’s genius! I hope your students have fun with it! There are 8 different playing cards – mine are printed on cardstock (colors or just white) and laminated. Then as we play the game, I’m using small marbles to mark what they hear. Sometimes we just allow one square per performer so students have to plan wisely to reach bingo first. Other times, I let students fill in up to a certain number of squares (3 or 4 usually based on how many are performing) so we’ll reach black out at the end of the performance class. Then students must make comments based on what they marked off – some comments are simple such as “Nice range of dynamics!”. Others may help students work on dropping high wrists or remembering smile. This helps them learn to positively critique each other as well (instead of those long silences where nobody has any comments about performances…). Good luck to everyone as Christmas and winter recitals approach quickly! I hope everyone has successful performance experiences.